The following is a list of seaplanes and amphibious aircraft, which includes floatplanes and flying boats, by country of origin. 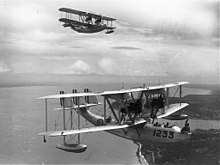 Seaplanes are any aircraft that has the capability of landing on water while amphibious aircraft are equipped with wheels to alight on land, as well as being able to land on the water. 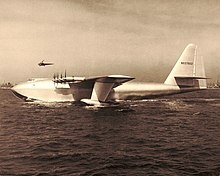 Flying boats rely on the fuselage or hull for buoyancy, while floatplanes rely on external pontoons or floats. 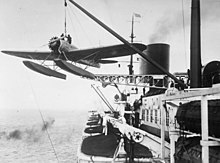 Some experimental aircraft used specially designed skis to skim across the water but did not always have a corresponding ability to float. This list does not include ekranoplans, 'Wing-In-Ground-effect' (WIG), water-skimmers, wingships or similar vehicles reliant on ground effect. 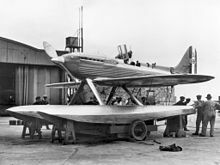 Fabre Hydravion – floatplane (1910) – also known as Le Canard (the duck), first aircraft to take off from water under its own power. Martin Mars waterbombers at their home base in Port Alberni, BC. ^ "Donnet-Leveque Type A". www.aviafrance.com. 2003-08-21. Retrieved 2011-02-06. ^ "Dornier Do S". histaviation.com. Retrieved 18 March 2018. ^ "Flightline II - L'Avion". www.coastcomp.com. Retrieved 18 March 2018.